Cisco Meraki ships a lot of hardware. In 2016 alone, we’ve sold millions of units to over 100 countries, and those numbers are only going up as Meraki continues to expand. For all of us Merakians, our continued growth is exciting and motivating. The only downside—shipping this many top-quality hardware products is really hard! Each unit must be carefully designed, manufactured, and tested. 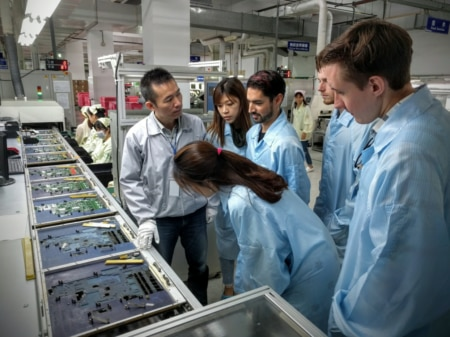 Getting this gargantuan task done is the job of the Meraki Hardware team, and to do it we spend a lot of time on the ground with our development partners in Taiwan. While regular business travel isn’t for everyone, the prospect of time on the road was one of the most exciting parts of my new role as Hardware Program Manager at Meraki. Today—shortly after returning from my first trip to Taiwan—I’d like to share a little bit about the experience. When it’s time to travel, we usually catch a direct flight from San Francisco to Taipei. This flight is a solid 13 hours! Once you add in a few extra hours for travel to and from the airport, security, customs, etc., and you’re looking at roughly 18 hours on the road between our homes in the Bay Area and our hotel in Taipei. It’s a long day! SFO to TPE is 6500 miles (or about 13 hours) in the air. We usually leave SF in the morning or early afternoon and arrive in Taipei in the evening of the next day. That’s because—in addition to the flight time—Taiwan is 13 hours ahead of SF. Talk about jet lag! When we’re on the ground in Taiwan, it’s time to get to work. That work may be any number of things, depending on the current stage of the product development process. Early in the process, we’ll sit down with our manufacturers and communicate the vision for the new product. This helps our partners allocate their resources effectively, so they will be ready to manufacture when we want them to. We also clearly communicate our requirements for mechanical and electrical components, which helps us collaborate to define and set up our testing and measurement parameters early. In the middle of the process, we will oversee small prototype manufacturing runs and check to make sure everything works as we expect. We’ll also help define the exact procedures for assembling and testing each unit to ensure maximum quality. Ruby, Nick, and Nathan inspect an assembly line. Further along in the process, we’ll check the progress of our large manufacturing runs, or troubleshoot any errors that have arisen. One example of this occurred while inspecting plastic parts for one of our newest products. We realized that a thin strip of plastic was being bent somewhere in the manufacturing process, resulting in a poor appearance when the product was fully assembled. We inspected the parts coming out of the machine and the steps of the assembly process. Eventually, we realized that the assembly line operators were holding the parts too firmly when they were newly-made and still malleable. We changed the assembly process to allow the plastic components to cool fully before the rest of the product assembly process began, and the problem was solved. When we’re not working directly with our manufacturing partners on our hardware products, we’re probably bouncing around the country building relationships with various other vendors and partners, like the people that manufacture our electrical, plastic, and metal components. Some of the technology we get to see is truly amazing! Metal stamping machinery so forceful that the building housing it needs a reinforced foundation, PCB assembly lines fully automated by high-speed robotics, hot plastic parts fresh out of the injection-molding machine; the tools that build modern electronics are truly impressive. It’s a lot of work to get to Taiwan, and there’s even more work to do once we get into the country. But it’s not all heads-down time. The Hardware team has a lot of fun in our spare moments abroad. We get to eat local Taiwanese delicacies, like beef noodle soup and the infamous stinky tofu. Additionally, we often spend some time visiting cultural landmarks—like an evening at one of Taiwan’s famous Night Markets. 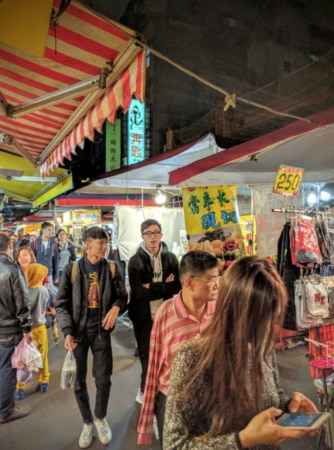 The Night Market is a great place to buy souvenirs and sample Taiwanese street food. Taiwan and its culture are vibrant and fascinating, and I feel privileged to get to experience a piece of it. There’s a common saying in the hardware world—“hardware is hard.” And it’s true—it takes a lot of time and energy to design, develop, and manufacture a great hardware product at scale. For the hardware team at Meraki, that means a lot of time on the ground in Asia. And while it can be tiring, it’s also fun and incredibly rewarding to see the world and play a big part in developing great new technologies. If you love travel and creating great hardware, keep an eye on the Meraki jobs page for high-flying opportunities!